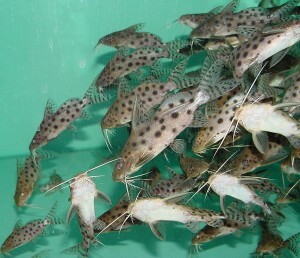 The Synodontis Ocellifer Catfish (Synodontis ocellifer) hails from the Gambia River and various other river systems of Northern and Western Africa. They inhabit river basins from Senegal to Chad; more specifically the Senegal, Gambia, Volta, Chad, and Niger basins. The Synodontis Ocellifer is a handsome peaceful catfish that has a pale yellowish brown body with black spots. Some specimens have a lighter background coloration or minimal spotting, but the adipose fin is the main characteristic to look at when making comparisons to other spotted catfish species. The Synodontis Ocellifer catfish has an extremely long adipose fin that runs from the caudal fin to almost the dorsal fin. All species of Synodontis catfish have a hardened head cap with an attached humeral process that is directly behind the gill opening and points towards the rear. Both the dorsal and pectoral fins have a hardened, serrated first ray and the caudal fin of this species is always forked. Synodontis Ocellifer catfish have one pair of maxillary barbels, sometimes with membranes and occasionally branched. The two pairs of mandibular barbels have nodes attached and are often branched. They have short cone shaped teeth in their upper jaw, and movable “S”shaped teeth in their lower jaw. Synodontis Ocellifer Catfish can rub the base of their pectoral spine against the pectoral girdle to make an audible “squeaking” sound when disturbed or in distress. Tropical fish keeping enthusiasts value the Synodontis Ocellifer Catfish as a peaceful bottom scavenger that gets along well with other fish in community aquariums. They need a densely planted 55 gallon aquarium or larger with plenty of rocks, driftwood , and a stable temperature to keep them healthy and happy. The Synodontis Ocellifer is a very peaceful species that appreciates having several places for them to hide in their tank. 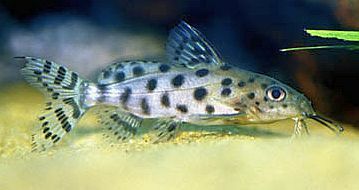 To date there have been no reports of the Synodontis Ocellifer Catfish being successfully bred in an aquarium setting. Synodontis Catfish are omnivores and will readily accept a good quality flake food, sinking catfish pellets, tubifex and freeze dried bloodworms. Wild caught fish are usually available for purchase when they are 3″ to 4″ in length.